The Veriton® N282G and N281G come with Genuine Windows® 7 Professional, pack powerful components into an ultra-compact, diamond-shaped chassis that can stand alone or snap onto the back of select Acer monitors. These handsome gray and black nettops come matched with an all-black USB keyboard and mouse, so you’re set for big productivity in a tight work environment. * If upgrading after initial purchase, one or more of the memory cards provided with the system may have to be replaced with optional larger memory cards in order to achieve the maximum capacity. A 64-bit operating system is required to enjoy the ultimate performance of 4GB or higher memory. A 32-bit operating system is limited to using 3GB of the available memory. *When referring to storage capacity, GB stands for one billion bytes. Some utilities may indicate varying storage capacities. Total user-accessible capacity may vary depending on operating environments. 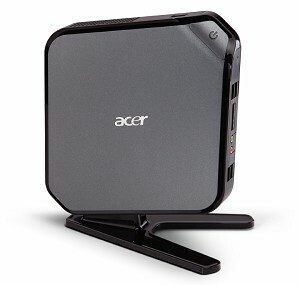 *For a free copy of the standard limited warranty end-users should see a reseller where Acer products are sold or write to Acer America Corporation, Warranty Department, P.O. Box 6137, Temple, TX 76503.